Additional Info: From gorgeous beaches to the unique flora and fauna of the Amazon Rainforest there is plenty of places to discover. 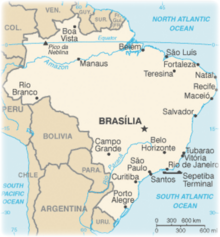 Brazil is the fifth largest country by geographical area, the fifth most populous country, and the fourth most populous democracy in the world. Brazilian topography is diverse, including hills, mountains, plains, highlands, scrublands, savannas, rainforests, and a long coastline. The extensive low-lying Amazon Rainforest covers most of Brazil's terrain in the North, whereas small hills and low mountains occupy the South. Brazil is home to the Amazon, the largest river in terms of volume of water, and the second-longest in the world. 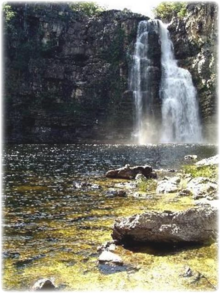 Brazil's Parque Nacional Chapada dos Veadeiros, north of Brazil, affords beautiful views and hikes through savannah scrub land, valleys and spectacular falls. The park has two official trails and you can only visit the park with a guide. It's a rolling valley of spectacular falls, rugged savannah forests and desert-like vistas. It takes a full day to do each trail and one can easily spend four to six days doing hikes both within the park and in the area. Many endangered species are found within the park's boundaries, such as the maned wolf, capybaras, rheas and others. To reach the park, you can drive on paved roads from Alto Paraiso to the village of Sao Jorge, where the park entrance is located. The road leading into the park is unpaved. One nice and not too difficult hike is the one to Carioca Falls - and with stunning scenery to boot. Most hikes in this area are guided. Along the way, you will be told about the features of the area, passing by giant holes where people used to mine for crystals. Carioca Falls itself is a spectacular canyon set off with two narrow falls plunging into a wide pool of water. There are some great spots to stop and swim along with other hikers at the pool. Isle Grande contains an endless myriad of hiking trails stretching nearly fifteen miles, which will lead to hidden white secluded beaches, great snorkeling and diving locations, lush primary jungle and hidden waterfalls. Isle Grande contains the necessary tools for the traveler to access hiking trails, the best beaches in Brazil and famous snorkeling locations. It is an easy island to get to and great for relaxation and recovery. » Italianos, 5.10a, 2 pitches. Beautiful and well protected face climbing. Can be connected to other routes, in a total of 6 pitches to the top. » Stop Chimney, 5.6, 7 pitches. Classic runout but easy chimney. » LagartÃ£o, 5.11c, 7 pitches. First two pitches are traditional climbing, the rest is bolted. » Ibis, 5.10d A1, 10 pitches. Runout and committed. Some parties climb it in two days, sleeping on one of the ledges in the first half of the route. 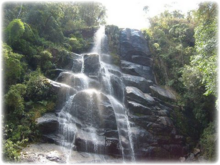 Itatiaia National Park, established in 1937, is the oldest national park in Brazil. 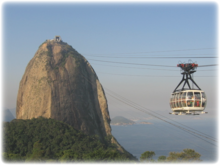 It is located on the border between Rio de Janeiro and Minas Gerais states. The park is part of the Mantiqueira mountain range, and home to Brazil's third highest mountain, Pico das Agulhas Negras, which stands at 2,878m (9,442ft). This peak is visible to the northwest of Resende when driving between Sao Paulo and Rio de Janeiro on the Via Dutra highway, which is the easiest route to get there. There is a 400 m climb to the top, featuring several levels of climbing difficulty. It is excellent for climbing enthusiasts. From the Agulhas Negras peak one can see three states: Rio de Janeiro, Sao Paulo and Minas Gerais. Guides must be hired to make the ascent, and they can be contacted at the hotels or in tourist agencies in Itatiaia. When you think of ecotourism in Brazil, you can't help but think about the great Amazon Rainforest, the moist broadleaf forest in the Amazon Basin. The area, also known as Amazonia or the Amazon Basin, encompasses 1.2 billion acres and is located not just within Brazil (which has 60%) but also Colombia, Peru, Venezuela, Ecuador, Bolivia, Guyana, Suriname, and French Guiana. As the largest tract of tropical rainforest in the Americas, the Amazonian rainforests have unparalleled biodiversity. More than 1/3 of all species in the world live in the Amazon Rainforest. As well as an amazing adventure, eco-tourism is one of the only ways locals generate income from the rainforest without disturbing the environment. There are more and more tour operators offering guided Amazon tours with ecotourism in mind - including hiking through the forest, boat and canoe rides, fishing the carnivorous Piranha and Parrots and Macaws. 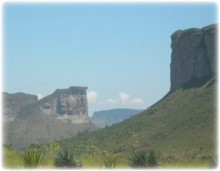 The Chapada Diamantina National Park, in the Chapada Diamantina region of Bahia state in the northeast, is approximately 250 miles inland from Salvador, the capital city of Bahia. The region is semi-arid; however, it has no shortage of water, from the many rivers and streams. On The park is typified by hills, mountains, valleys and monoliths, with few plains. On the border with Argentina is the Iguazu Falls - Taller than Niagara Falls, these falls are the result of a volcanic eruption which left yet another large crack in the earth. 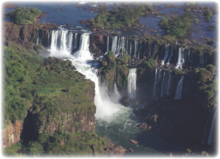 The falls are part of a singular practically virgin jungle ecosystem protected by Argentine and Brazilian national parks on either side of the cascades. The view from the Brazilian side is the most panoramic and there are helicopter rides out over the falls from Foz do Iguacu. You may also take boat rides out to the falls. The light is best in the morning for photographs. Best seen from the Brazilian side is the spectacular Devil's Throat, garganta del diablo, where fourteen falls drop 350 feet with tremendous force. Fernando de Noronha is an archipelago in the Atlantic Ocean; around 220 miles offshore from the Brazilian coast. The main attraction is the maritime flora and fauna; one can spot sea tortoises, dolphins, albatrosses, among many others. Fernando de Noronha is considered the best scuba diving place in Brazil. Warm water and exuberant subaquatic fauna and flora can be found. A Brazilian warship, the corvette NAeL Ipiranga, sank in 1987 and is lying in pristine condition at around 190ft. Anyone who thinks of events and holidays in Brazil almost simultaneously thinks of Carnival. The world's largest carnival celebration is held in Brazil. . 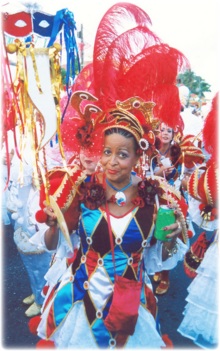 The Brazilian Carnival is an annual festival in Brazil held 40 days before Easter and marks the beginning of Lent. An important part of the Brazilian Carnival takes place in Rio de Janeiro, with samba schools. These are large, social entities with thousands of members and a theme each year. Blocos are small informal groups also with a definite theme, usually satirical of the current political situation. There are more than 30 blocos in Rio de Janeiro. Bandas are samba musical bands, usually formed by enthusiasts in the same neighborhood. In 1982, the former governor of Rio de Janeiro, Leonel Brizola, created the Sambodromo, a purpose-built parade route complete with bleachers on either side, where the parades happened since then. Carnival in Rio de Janeiro is known worldwide for its elaborate parades staged by the city's major samba schools in the Sambadrome and is one of Rio's major tourist attractions. 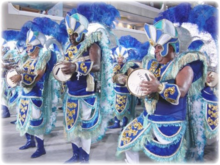 Each samba school rehearses all year round for this event and all of its members take part in the rehearsals, whether experts or not. It is a place where people who always wanted to write a song, play a percussion instrument or choreograph a dance will have their opportunity. It is usual that during the carnival aristocrats dress up as commoners, men cross-dress as women, and poor people dress up as princes and princesses - social roles and class differences are expected to be forgotten once a year, but only for the duration of the festival. 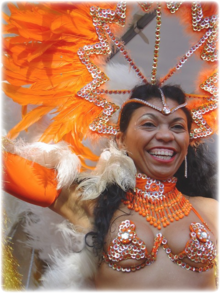 Visitors to Brazil should keep in mind that all 5 days of Rio Carnival are public holidays all over Brazil - therefore most shops will be closed during the period covering Carnival Rio. Traditionally, this is also the culmination of the Brazilian summer holidays and Carnival Rio also marks the end of the long school holidays (which start in December). As a result, travel during Rio Carnival time can be difficult.